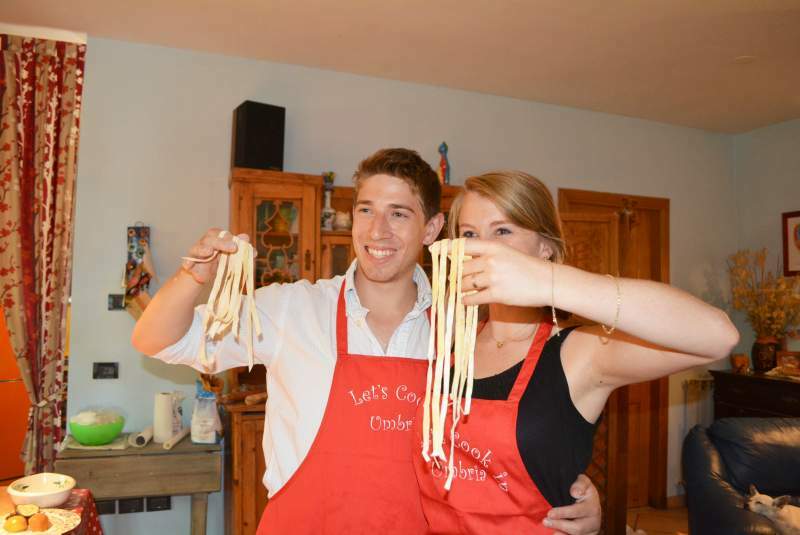 Gift Vouchers:the best present for lovers of italian cousine and food! The best present for lovers of italian cousine and food! Our gift vouchers are a great idea for anyone with an interest in food and cooking. Gift voucher are valid for any program of Let’s cook in Umbria and give you the opportunity to make a special present to family members, friends or colleagues for all the occasions: Easter, Christmas, Weddings, Birthdays, Anniversaries, Retirement gift, Mothers/Fathers Day, a ‘thank you’ from work colleagues and friends. Our vouchers cover all the courses and packages we offer, including the one day options. If the voucher cover the total cost of the package we will ask for a 30% deposit, with the balance payable 4 weeks prior to the start of the agreed holiday dates. The starting price is 100 euro/voucher, you just pay what you want to and let the recipient choose to add extras according with the chosen cooking program . Start off with an email to me setting out basic details of what you’d like to purchase. I’ll then send you a detailed voucher request-form which you have to fill out with the details for the payment and send back to me. After the payment I’ll send your Gift Voucher. 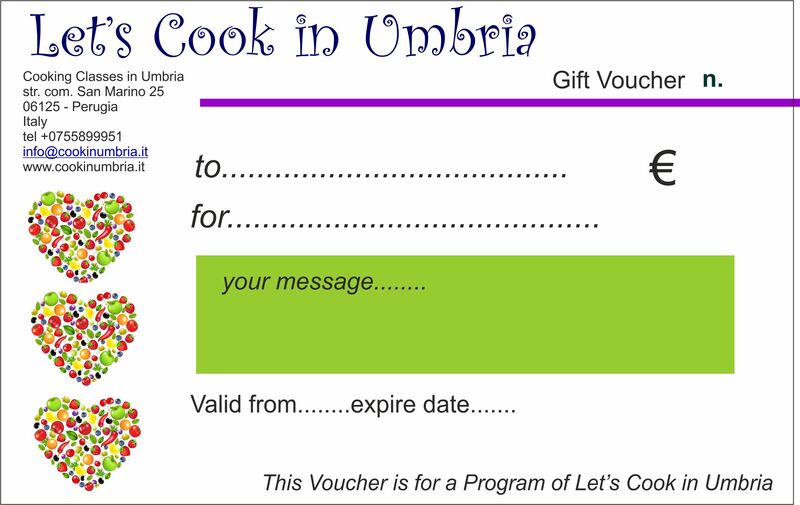 Send us an email requesting more information on obtaining a Let’s cook in Umbria gift voucher. The gift vouchers are valid for 1 year from date of issue. Vouchers become void after the expiration of one year from the date of purchase. available at time of booking. The vouchers are valid for the value printed on the voucher only. The vouchers are not transferable, cannot be redeemed for cash, and are non-refundable and cannot be used to purchase further vouchers. If the value of the voucher cover all the service we will ask for a 30% deposit, with the balance payable 4 weeks prior to the start of the agreed holiday dates. the balance must be paid in cash or by credit card. Le’s cook in Umbria is not responsible for lost, damaged or stolen vouchers. 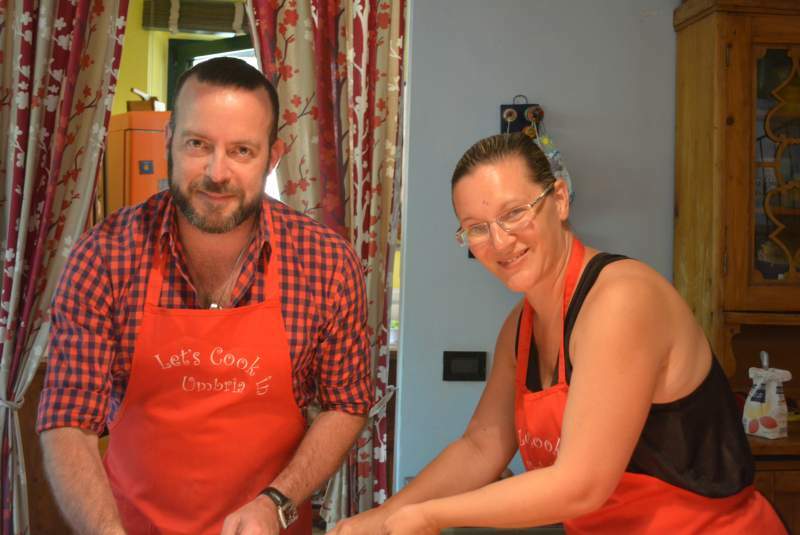 All bookings and travel are subject to Let’s cook in Umbria booking conditions. Voucher number must be provided at time of booking and original voucher must be returned to Let’s cook in Umbria upon confirmation of booking. The value of the gift voucher is in Euro.